Hi everyone, long time lurker and new member here. I have decided to make a blog about my marathon painting task for this year to keep me enthused and to keep me painting towards the goal of having all my stuff painted. This is made more difficult by my painting time interrupted by university so i will be posting frequently during the breaks but not so much during term time. 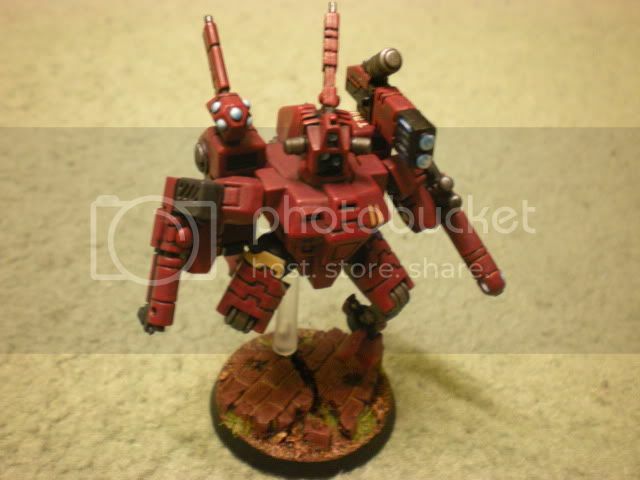 First up for a paint job are my Tau. These guys are almost done [well my 2k list at least] and i am hoping to finish them by the 9th of January and i need to paint a hammerhead, piranha, 3 crisis suits and 10 pathfinders before that date but for now here are some of the stuff that has been done so far. 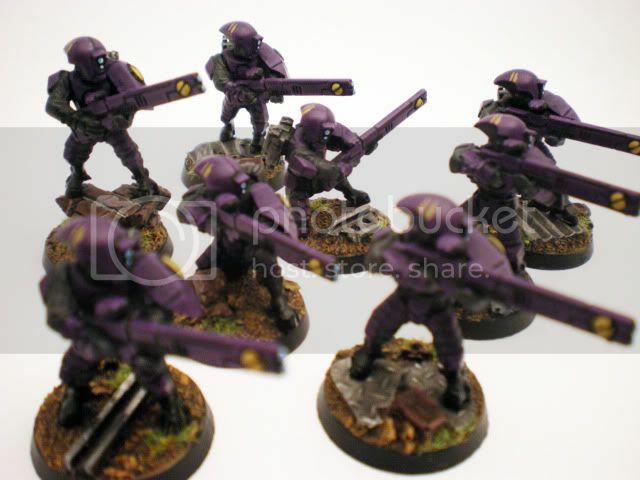 The Army scheme as a whole is purple but the crisis suits have a ranking colour scheme in that normal crisis suits are blue and the commander is red. I will update with more pictures of the army so far in the near future, but for now i hope you like them. not too keen on the scheme, but your bases are awesome! I can&#39;t say that I agree with this ranking system, but it is well executed. You&#39;ve got some skill with the paint brush . 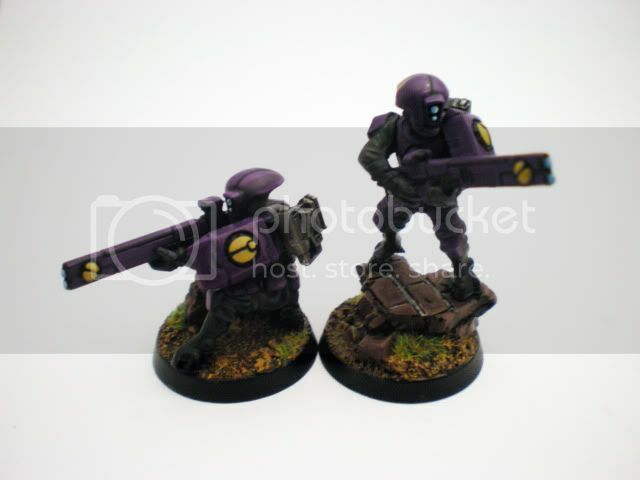 You can&#39;t have three weapons systems and a support system on your battlesuits, if they are glued on this may be a problem for WYSIWYG, I like the bases though. I also like the idea of the commander being a different colour, nice touch. I believe because they&#39;re bodyguards, they can take 3 battlesuit weapons and hard-wired equipment. 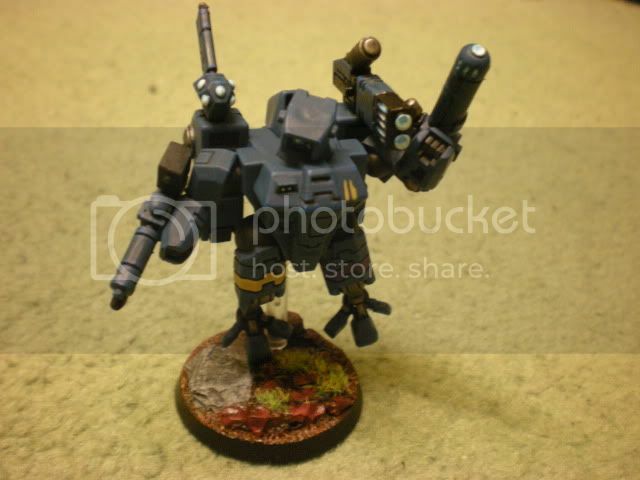 I had forgotten about that, I haven&#39;t played with my tau in a while. Hard wired systems don&#39;t have to be represented on the model though, I beleive. Indeed Hardwired wargear, must be declared (if you are in a full disclosure tournement) but do not need to be represented on the model since Hardwired wargear are built into the Suit or the pilot. Nicely done, they&#39;re both crisp and clean as far as I can see, good job! Nice idea on the ranking system by the way. 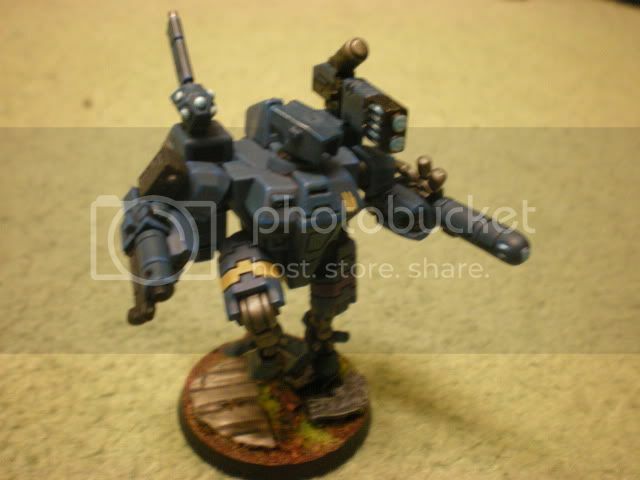 The bodyguard do indeed have hard-wired systems - they are represented on the miniatures but i always make clear what everyone is equipped with at the start of the game and strive to make things as clear as possible for my opponents. The weapons will soon be magnetised for diversity. Here are the next batch of miniatures - my two units of fire warriors. I have made a little progress on my pathfinders also and they should be painted soon and ready to post up after the rest of the stuff i have managed to do over the christmas break. 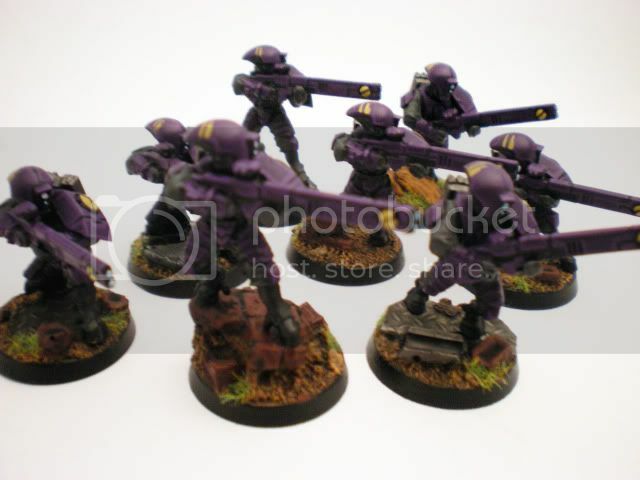 I was going to do a purple scheme, but i didn&#39;t have the guts to try it and used it as my sept colour instead. But these guys look really cool, nice work.